This is the first recipe I have posted. It is a super easy but incredibly delicious one. I spent a year living in Lake Tahoe, California and used to go regularly to a restaurant there called Sprouts Natural Foods Café where they served a lot of vegetarian friendly fare. One of my favourite things there was the A.T.O.M bagel. A.T.O.M. stands for avocado, tomato, onion, and monterey jack, and it is a delicious combination. It is also about as satisfying (and filling) as a slice of pizza. And while I wouldn’t go so far as to call it healthy, you do get a fair amount of veggies in there. You can make it as healthy or sinful as you like depending on what kind of bagel you use (I prefer sprouted wheat bagels, because they are soft and whole grain), and how much mayonnaise and cheese. I have tried it many different ways over the years, and it has always been good. It is great for a quick and tasty lunch. 1. Preheat oven to 350 degrees. Slice bagel in half and toast in the oven for 3-5 minutes (so it is a little crispy on the edges but still soft). 3. 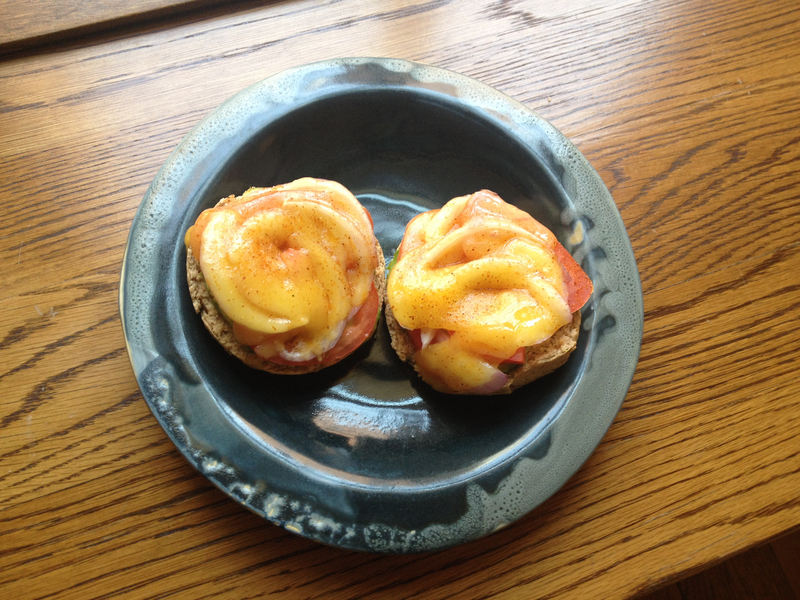 Spread mayonnaise on each side of the bagel, then top with avocado, sliced tomato, sliced red onion, and slices of cheese, then sprinkle the seasoning of your choice on top. I like to use the Pinto Bean Seasoning from Fiesta Market, but I have also used Spicy Herbamare and some other random seasonings, it’s all been good). 4. Put the bagels face up on a pan and turn the broiler on, then place the pan on the top rack. Remove from the oven as soon as the cheese is melted – or you can wait until it starts to bubble and brown a little. Either way, keep a close eye on it as this happens fast!